A narrow bridge on the Pathankot-Manali highway bypass has turned into a death trap as dozens of accidents have taken place here during the past three months while HP PWD is yet to do anything about it. A narrow bridge on Mol Khud on Palampur bypass has turned into a death trap as dozens of accidents have taken place here. The construction of as many as 17 rural roads in the Nurpur circle of the Public Works Department (PWD) in lower Kangra district has been impeded due to land disputes or non-availability of land. A Rs 150-crore super-speciality hospital in Dr Rajender Prasad Government Medical College (RPGMC), Tanda, will be functional by June next year. The District Senior Citizens’ Welfare Society has sought the setting up of a day-care home for the well-being of senior citizens who, in their old age could relax in a community spirit. The birth anniversary of noted artist Sobha Singh was celebrated at art village, Andretta, 11 km from here, recently. KG Butail, president of Sobha Singh Memorial Art Society, awarded students of the local Sobha Singh Government High School, who had participated in four events to mark the occasion. The Himachal Pradesh State NGOs Federation has taken exception to the total ban on extraction of building construction materials like sand, gravel and stones from khuds, rivulets and river sides in some districts of the state, which is proving a blessing for anti-social elements. Kangra town continues to lack basic amenities, including a sewerage system. The plan to develop an industrial area at Garnota, in Bhattiyat subdivision of Chamba district, appears to be a distant dream and has been neglected for the past more than 20 years. The successive state governments have failed to undertake the scheme, though the area falls in the industrial corridors of the state. There existed Fern Cottage near Ram Mandir where stands Rai Bahadur Puran Mull Dharamshala today (see photo). It is the oldest Dharamshala or Serai of Shimla. The toll barrier dispute at Shekhupura chowk under Indora police station was solved today following the intervention of Excise and Taxation authorities. The Shekhupura Sangharsh Samiti had submitted its complaint to the police station two days ago, alleging that this barrier was wrongly set up at the chowk on the Kandori-Damtal link road forcing vehicles coming from Damtal to Indora within the jurisdiction of the state to pay toll tax. A symposium was recently organised at Baggi to pay homage to former social activist and former State Sewa Dal chief, Chander Mohan Gupta. Addiction to drugs and liquor is a habit which has the potential to destroy an individual, his family and society and all responsible citizens should come forward to fight this menace and curb it with a heavy hand. A participant receiving a prize from the chief guest at the seminar. The CPM has stated that it will launch a statewide campaign demanding the inclusion of the Above Poverty Line (APL) along with the Below Poverty Line (BPL) families in the public distribution system (PDS). The party opposes the UPA government’s recent move to give direct cash subsidies to card holders. Prof Vinod Kumar Mattu has been given ICRTCCRB Gold Medal for his achievements in the field of biosciences and environmental sciences in general and in the field of insect biodiversity, apiculture, ecology, and behavioural studies in particular. The local Kashriya Kalyan Sabha honoured excise and taxation official PC Dadwalia, who recently retired from the Nurpur circle of the Excise and Taxation Department, and block medical officer Dr Dev Raj Riyal, who retired from Indora here. Lap Lambert Academic Publishing, Germany, has published the research work of Dr Hirday Paul Singh in a book form. "Radio in Agricultural Development", the PhD research work of Dr Singh was picked up for publication after technical approval of experts and has been assigned ISBN 978-3-659-30015-8. The retail price of the book has been fixed at 59.0 Euro and it will be available worldwide. The author will be given royalty based on the book’s sales. Mukesh Thapa (33), a resident of Dharamsala, has achieved a milestone by making his own portrait with a single hair of his beard. He used it as a brush and completed the portrait in one year, which figured in the Limca Book of Records. Thapa had a passion for painting and art since childhood. He worked for fifteen hours a day to sharpen his skills. Defending champions Pinegrove School, Subathu, lifted the All-India IPSC Girls Cricket Tournament Trophy, outplaying Modern School, Delhi, in a thrilling final. The tournament concluded at Mayo College, Ajmer. Though officials of the Public Works Department, Baijnath Divison, who maintain the road are well aware of the situation that the Palampur-Holta by-pass is used by thousands of vehicles daily to avoid the congested Palampur town, but till date no steps have been initiated either to widen the bridge or to construct a new one. The bridge had already lived its life as its foundations were washed away in the recent floods. Since this is a single bridge on Mol Khud with a narrow curve, therefore it has become a major accident hazard. Two-wheelers and other light vehicles are the main victims that roll down daily because of heavy traffic. 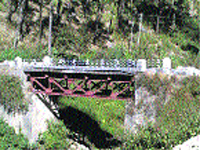 Enquiries made by The Tribune revealed that this bridge was constructed by the PWD about 50 years ago to connect Rajpur village. Later in 1970, the PWD connected the bypass via this small bridge. Though the PWD widened the road on both sides of the bridge to NH standard, but in the past 50 years no efforts were made to replace or widen the single bridge to NH standard, causing inconvenience to the public. A senior officer of the PWD while talking to The Tribune admitted that the bridge had become an accident hazard. He said till date the PWD had neither prepared any DPR nor asked for any funds for the construction of a new bridge from the government. The most number of roads which could not be started due to reluctance of local villagers has been reported in the Dehra division of the PWD comprising Dehra, Pragpur and Jaswan Assembly constituencies. The rural metalled roads under the centrally sponsored scheme, Prime Minister Gramin Sarak Yozna (PMGSY), are to be connected to all villages with populace of 250 or above, subject to availability of land or providing of land free of cost by the beneficiaries to the executing agency, PWD. BS Thakur, the superintending engineer, PWD circle, Nupur, said the department had fixed display boards on all proposed village-link roads left in lurch due to reluctance of villagers to transfer ownership of requisite land for the construction of pucca roads, depicting that roads were sanctioned but could not be built due to non-availability of land. “As a sequel, barring 17 villages, the residents of seven villages have been motivated to offer free land to the department and after completing land transfer formalities the Detailed Project Reports (DPRs) of these roads have been prepared to execute construction of the roads,” he asserted. In this connection, Gulab Singh Thakur, the PWD minister, opined that road connectivity was a must for the development of rural areas and all efforts were being made to persuade the beneficiaries to offer voluntary land transfers to the PWD in the state to ensure early construction of metalled roads in the villages where work could not be executed due to land disputes. He said the department had been directed to solve this problem by taking local gram panchayats into confidence. He exhorted villagers to come forward and support the department in this connection. The foundation stone of the building was laid by the Union Minister for Health and Family Welfare, Ghulam Nabi Azad, on November 24, 2010. The Principal, RPGMC, Tanda, Dr Anil Chauhan, said the work on the super specialty wing of the college was started after the old building was dismantled. However, the construction of the building was delayed by nearly a year due to technical reasons. He said as the construction was proceeding on a war footing, it would be complete six months ahead of its scheduled time and the hospital would be functional from June next year. He said the state government had contributed Rs 25 crore for this project while Rs 125 crore was provided by the Government of India. 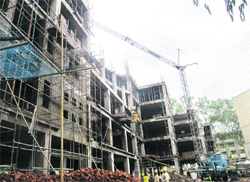 Of all the funds, Rs 80 crore would be spent on the construction of the building, purchase of equipment and furniture. Another Rs 15 crore would be spent on a gas pipeline and fold-facility rooms, Rs 20 crore would be spent on civil works to meet the MCI requirements, hostels and lecture theatres and Rs 10 crore was earmarked for consultancy, contingency and provision for escalation, he added. He said the building would house six super-specialty departments, including radio oncology, cardiology, cardio-vascular, thoracic surgery, nephrology, gastroenterology and neuro surgery departments. Dr Chauhan said the building would be ready in all respects before June 2013 as the equipment-purchasing process had begun already. He said the process of appointment of super specialists too had started and so far appointments had been made for the Departments of Herpetology, Cardio-Vascular Thoracic Surgery, Neurology and Nephrology, whereas offers from super specialists in radio oncology and cardiology were pouring in. “This hospital will be one of the best super-speciality hospitals of the northern region with latest equipment and qualified super specialists,” Dr Chauhan added. The society has already forwarded a proposal at Rs 4 lakh to the state government, but its efforts were in vain. It has again submitted a fresh memorandum to the Chief Secretary of the Himachal Pradesh Government to expedite approval of the proposal and release the first instalment of the amount, so that the functioning of the day- care home could be undertaken. The society has also urged the Chief Secretary to direct the Deputy Commissioner of Chamba to earmark approachable land of two biswas for the construction of the day-care home for the senior citizens at the district headquarters town of Chamba. The accessible location best suited to each senior citizen could help them in spending six to eight hours in a day pleasantly. The memorandum revealed that the society had planned to construct a day- care home with government assistance and to look after its functioning under its supervision. The home envisaged providing day-time food, evening tea, indoor games, television and newspaper facility and free medical check-up by an experienced doctor to be hired by the society, the memorandum stated. To begin with, private buildings could be rented out to run such a home till some land for the construction of the home was identified and the building got constructed. Through this, the society would also be able to generate employment for at least two unemployed youths who could be appointed by the society as a cook and a sweeper, the memorandum further said. Butail recalled the contributions of the artist to the art world and said the late artist had brought the village on the international map. He asked the students to imbibe virtues of the great artist to achieve success in life. Dr Hirday Paul Singh, secretary-general of the society, said the artist loved children a lot and wanted parents to provide a favourable environment to them so that their natural talent may flower into a genius. He assured the students that the Art Society would help them in career guidance programmes. The society would also hold free painting classes for the students and budding artists of the area, he added. Naman Bindra, headmaster of the government school, thanked the society for awarding prizes to students. The prize winners included Arjinder, Muskan Sarin and Abhishek as the first, second and third position holders respectively in painting competition. Shilpa, Sakshi and Anjali Dhiman secured the first, second and third position respectively in the declamation contest while Suraj, Rupali and Anjna were the first, second and third respectively in slogan writing contest. A team of Richa and Manish stood first in the quiz competition. The team of Shilpa and Jyoti stood second and Muskan and Anjali secured the third position in the same. Members of the Art Society and school teachers also participated in the prize giving ceremony. Talking to mediapersons here recently, federation state president Ram Singh said total ban had also escalated costs of construction and development works launched by the government in various districts of the state. He said things had gone worse as the neighbouring state governments had also put a total ban on this activity and even import of these materials from other states had been stopped. Singh said despite the ban on this activity, some influential politicians and others were minting money by extracting these materials from khuds and rivulets without any checks and were indulging in loot as prices of these materials have shot up to several times within last few weeks. Singh said this issue was also raised by several members of various districts and states in Federation executive meeting held recently and a resolution was adopted urging the government to reconsider the anti-people policy and lift the ban from selected places for extraction of these materials to help ease the situation. He said the ban should be lifted in such a way that it does not affect drinking water sources and environment of the area- the two most quoted reasons for this ban. On January 17, 2004, the then Chief Minister Virbhadra Singh, along with IPH Minister Kaul Singh Thakur, laid the foundation stone of a Rs 9.28 crore sewerage scheme on the premises of local Government polytechnic. But nine years have passed and the work is yet to be completed. Former Deputy Financial Controller ML Sharma said searching a site for the treatment plants and paucity of funds led to the delay in the completion of the project. Parekshit Raj, a retired Executive Engineer of the PWD, said the scheme had no proper planning and the layout plan for the sewerage pipes was yet to be finalised. Surender Thakur, a social activist, said pipes had been laid in some parts of the town but the work was still not complete. The work on the treatment plants in zone I and II was in progress and in Zone III the work had not even started. During 2011-2012, only Rs 50 lakh were sanctioned for the project. However, more than Rs 7.63 crore were spent and the cost of the project had escalated from Rs 9.28 crore to Rs 13 crore, sources said. The SDO, Kangra sewerage scheme, said more than 65 per cent of the work had been completed during the past nine years. IPH sources said as it was an urban scheme so it had been diverted to the Urban Development Department (UDD) but SDO, UDD, said the department had no role in the project. The location for the third treatment plant near old Kangra was finalised and a budget of nearly Rs 1 crore was approved for the treatment plant, the officials added. Sources said land measuring a 100 bighas was identified and acquired for the purpose of setting up the industrial area at Garnota in 1989. But the land was lying unused. At present there was no site in the district for industrial growth. Badhte Kadam-2012”, a 10-day campaign to create awareness about disability among people conducted by Udaan (State Nodal Agency Centre of the National Trust for the Welfare of Persons with Autism and Multiple Disabilities) saw the volunteers criss-cross through the interior areas of the hill state. The agency organised as many as six well-attended ‘melas’ in remote pockets like Nirmand in Kullu and Chowari in Chamba which not only drew large crowds but also a number of special children. The campaign was carried out in a festival mode to help the people overcome the negativity associated with disabilities and educate them that the special children could also be trained to live a dignified life in society. Skits were performed on the theme of disability (see photo) that enabled the gathering to appreciate the associated problems and the need to change their outlook towards the special children. The volunteers also gave detailed information about the facilities being extended by the government for the education and training of the special children. State coordinator of the agency RS Rana said the idea of holding ‘melas’ was to ensure social and cultural integration of persons with disabilities, who were cut off from the mainstream. Sports and other events were organised for the special children and gifts were distributed to make them feel that they were valued members of society. The focus of the campaign was on the rural areas where people were not aware that special children could be provided education and training and that they could contribute to society like the normal people. He said there was a need to coordinate the efforts in the disability sector, so that maximum benefits percolated down to the people for whom all the schemes were being formulated. National coordinator Muthu Subramaniam specially came to attend the flag-off ceremony of the campaign, launched from the state capital, at which Director of Social Justice and Empowerment Abshiek Jain was the chief guest. Besides Kullu and Chamba, special awareness ‘melas’ were also held in Sirmour, Solan, Una and Hamirpur districts and the volunteers encountered hardships due to inclement weather to cover 1,400 km passing through remote and inaccessible areas of the state. Umang Foundation, a public welfare trust, has drawn the attention of the authorities concerned to the inability of the state to set up a human rights commission. The foundation said it was most unfortunate on the part of the government to abolish the commission and the action had not been undone. Him Academy Public School (HAPS), Hamirpur, has been honoured by the British Council of India for better utilisation of technology and mutual cooperation with Gautri Public school, England. The director of the British Council in India, Rob Lyons, recently presented the award to the Secretary of the HAPS, Pankaj Lakhanpal, and the Principal of the School, Naina Lakhanpal, at a ceremony held in Mumbai. The British Council has given the award to HAPS in appreciation of the cooperation extended by it to the Gautri Public School, England, and for jointly implementing projects with the Gautri School. The students of two schools have taken joint projects in the areas like trade fair, children’s rights, Hindi, English and French dictionaries, video- conferencing and few other online projects. There existed Fern Cottage near Ram Mandir where stands Rai Bahadur Puran Mull Dharamshala today (see photo). It is the oldest Dharamshala or Serai of Shimla. Who was Puran Mull? I had written about Haroli (Una) village in these columns and had also mentioned of two great philanthropists that the village had given to the state -- one was Rai Bahadur Jodha Mull and the other was Rai Sahib Puran Mull. Nidha Mull was the father of Puran Mull and he had established a firm Messers Nidha Mull Puran Mull at Edwards Gunj in 1842. Pamela Kanwar writes in Imperial Simla, “Astute management and the ability to drive a shrewd bargain made him the wealthiest and best-known commission agent and moneylender in Simla. Puran Mull had a hand in every potentially paying business, whether it was promoting and financing potato growing or forest contracts. He served as modi, supplying goods to the Thakurs and Ranas of the surrounding hill states… Puran Mull was a respected figure amongst the Simla Soods; he provided loans at easy rates of interest to needy Sood retailers, and made donations to the Sanatan Dharam temple near the Ganj.” She writes elsewhere in the same book, “By the close of the 19th century “the rich men who could be counted on the fingers of your hand” and owned most of the Lower Bazaar property were, it was said, all Soods. The rest petty traders, also mostly Soods, owned property which was “mortgaged up to the chimneys” to a handful of their rich kinsmen.” One of the kinsmen was Puran Mull (see photo). He, however, never forgot that “doing nothing for others is undoing of ourselves”. So on Monday, August 5, 1929, he made a charitable dedication of the property that was then known as Fern Cottage along with a separate adjoining building of godown, compound and lands attached thereto for the benefit of the general public for charitable purposes and particularly for establishing a Serai for the stay of travellers. It was named as Puran Sud Ashram. The oldest Serai in Shimla was, thus, established. The oral dedication was converted into a Trust Deed by Puran Mull on the April 11, 1930. The donated property was handed over to the trustees -- Sir Jia Lal, judge of the Lahore High Court, Saraf Mull, Biroo Mull, Rai Bahadur Jodha Mull Kuthiala and Kaudoo Ram -- all big businessmen. The work of construction of a new building in place of the old one started but Puran Mull died in 1932 before seeing his dream converted into reality. He was farsighted enough and had before his death donated a building 91, Lower Bazaar, to the Trust so as to ensure its financial security. The trustees continued with the work of construction of the Serai and could complete it in 1933 to be inaugurated by Raja Rana Bhagat Chand, the then ruler of Jubbal State on August 14, 1933. Since then it has been providing comfortable stay at reasonable rates to the visitors here. I am expressing the feeling of many a traveller to Shimla after they stayed in the Serai in the words of Samuel Johnson: “There is no private house in which people can enjoy themselves so well as at a capital tavern (serai)…No, Sir; there is nothing which has yet been contrived by man by which so much happiness is produced as by a good tavern or inn.” Kaudoo Ram, son of Puran Mull, was the first President of the Trust and held the post with distinction and responsibility till his death on the August 23, 1964. The present president is Yadupati Sood, an advocate of Shimla. The dharamshala has two halls, 19 rooms and a dormitory having capacity of 40 beds and being looked after well by its 11 on-rolls employees. It is considered as an ideal place for organising functions in the heart of the town. Rain or shine, I have attended several functions here and give credit to the Trust that is delivering goods for the past 80 years. The Trust has also been doing another good job of extending financial help to other educational and religious institutions. Do not think that your body is your home; it is a serai where you stay briefly. Several writers, poets and people from all walks of life paid floral tributes and attended this symposium, which was presided over by Manorma Gupta, wife of late Chander Mohan Gupta. Writer, Dr RK Gupta, remembered life and times of Chander Mohan Gupta through his poems Maan and Kalchakra. Poet Ravi Rana Shaheeen presented gazals depicting life of former social activist. Senior writer and poet, Deenu Kashyap released a book tiled Prem Patra, written by Dr Ganga Ram Razi a close friend of Gupta. Dr Razi also spoke in detail about the life of his friend. A young writer Chet Ram presented a short play on this occasion. Nanak Chand Saini, a close associate of Chander Mohan Gupta, narrated several inspiring events and paid an emotional tribute to his former friend. President of Baggi panchayat, Vikas Gupta, Balh BDC vice chairman, Pradeep Thakur and many local residents and relatives of Chander Mohan Gupta were present on this occasion. forward to fight this menace and curb it with a heavy hand. This call was given by Superintendent of Police, Santosh Patial, the chief guest, while addressing a district-level seminar and competitions on the subject of ‘Nasha Nivaran’ organised by the Department of Information and Public Relations at Government ITI here recently. Patial said that since there was more tendency in developing youth to partake in this bad habit, teachers and parents should be very careful and look into the daily routine of their students and wards and should see to it that they do not fall in bad company and are not led astray by anti-social elements. SP said that the police was doing its best to control and check this illicit trade and arrest and apprehend these social criminals, but this tirade and campaign can only be successful with the active support and cooperation of the general public. He urged everyone to ensure that no one in their family goes down this dark path and also to ensure that those in contact with them are also free from this evil. Earlier, District Public Relations Officer, Amar Singh Thakur, said that the department has launched a consistent campaign against this bad habit throughout the state and they are concentrating their efforts on schools and colleges where young minds are easily led in the wrong direction by selfish dealers and their agents. District Language Officer Dr Anita Sharma, senior journalist Arun Dogra, ITI Principal Kuldip Chand Chadha, District Health Educators Roma Sharma and Rakesh Babu and other officers Hari Dass Chauhan , PK Garga , Renu Thakur etc also addressed the largely attended day-long seminar. The chief guest also distributed cash prizes of rupees 3,000, rupees 2,000 and rupees 1,000 to those who stood first second and third respectively in Poster Making on subject of ‘Nasha Nivaran’ i.e. Manisha Rani , Nisha Rani and Bhawana Thakur . An on-the-spot Painting competition was also held. In a statement here recently, CPM general secretary Bhupender Singh claimed that the APL and BPL lists prepared by the state government was faulty. The party stood for covering APL families also under the PDS system and the Food Security Act and they should be entitled to food quota of 35 kg per month at the rate of Rs 2 per kg, he said. Even the direct cash subsidies to card holders would make the common man pay more as they would be forced to buy items from high-rise markets. The cash transfer was not linked to the price rise and, hence, the scheme was not beneficial for the poor, he added. The CPM said the party would launch a statewide signature campaign on both issues to bring about public awareness in the state. Prof Mattu from the Department of Biosciences of Himachal Pradesh University (HPU) is presently the director of the Integrated Himalayan Studies. The award was given to Prof Mattu on December 3 at a function at Bareilly in Uttar Pradesh during the International Conference on Recent Trends in Climate Change Researches vis-a-vis biodiversity. Eminent personalities from different universities and institutes of 22 states and seven countries were present on the occasion. Prominent awards given to him by various scientific bodies include the IAES Award, Bharat Excellence Award, International Glory Award, Indian Golden Achievers Award and the Gem of India Award. He is presently working on the Global Pollination Project for Conservation and Management of Pollinators of the Himalayan region being run in seven countries of the world and is sponsored by GEF, Food and Agricultural Organisation of the United Nations. Prof Mattu is actively involved in research on various aspects of apiculture, biodiversity, sociobiology, acarology and conservation biology. The chairman of the sabha and former MLA Ranjit Bakshi honoured the duo with shawl and cap and lauded their services as government officials. He said the honoured government officials had always served the people with honesty and kept their image clean. Dr Singh was fascinated by the success of Community Radio (CR) in rural development, including popularising the local folk and literature. He has appreciated the role of radio, especially the active role of FM stations of Dharamsala and Hamirpur, in farm development of the state. Born on May 25, 1964, Dr Singh obtained his school education from his native village and did graduation in agriculture. He obtained a post-graduate degree in Journalism and Mass Communication, English and Hindi. Thereafter, he obtained his doctoral degree in Journalism and Mass Communication from Punjabi University, Patiala. Dr Singh started his career as a subeditor with a national daily in 1987. In addition to technical writings and editing technical publications for over 15 years, he is a creative writer and has written on human relations, nature, stark realities of life, etc. He has also produced pictorial and informative literature on artist Sobha Singh in his capacity as the secretary-general of the Sobha Singh Memorial Art Society. He is associated with a number of literary, art and professional bodies. Dr Singh is working as the Joint Director (Information & Public Relations) at Choudhary Sarvan Kumar Himachal Pradesh Agricultural University (CSKHPAU) at Palampur and has four more books to his credit. His published works include “Udaas Rishton Ka Shehar” (1988), “Yuvtiyan” (1999), “Sobha Singh Kala Deergha” (2001) and “Hatheli Bhar Ujala” (2005). His monograph, “Sant Kalakaar S Sobha Singh” (2001), was published by the HP Language and Art Academy. Besides, he has also edited a book on Sobha Singh. 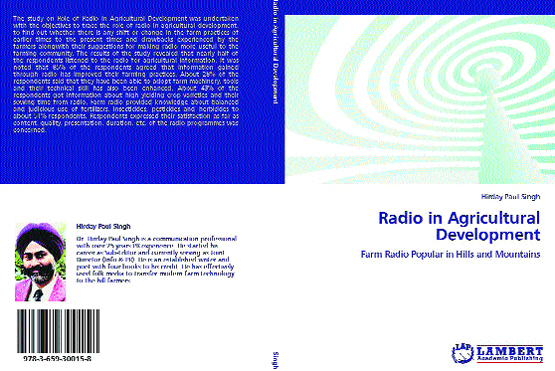 The title page of the book, "Radio in Agricultural Development", with the picture of the author, Dr Hirday Paul Singh. Mukesh Thapa (33), a resident of Dharamsala, has achieved a milestone by making his own portrait with a single hair of his beard. He used it as a brush and completed the portrait in one year, which figured in the Limca Book of Records. 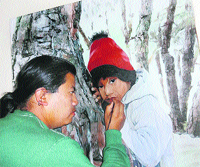 Thapa had a passion for painting and art since childhood. He worked for fifteen hours a day to sharpen his skills. The young artist, without receiving any proper training in the field of painting, has held exhibitions at Kangra Art Museum, Dharamsala, Shimla, McLeodganj and Pune besides an exhibition for the victims of Tsunami, at Jalandhar. It took him six years to learn the art of making an oil painting using a single hair of his beard and ultimately made his own portrait with his new found ‘tool’ in one year’s time. Mukesh has made 600 paintings and has created an Art Gallery at Shayam Nagar Dharamshala. Mukesh said his art had been appreciated by renowned personalities which includes Prime Minister Dr Manmohan Singh, Chief Minister Virbhadra Singh, actor Amitabh Bachhan, Salman Khan and cricketer Rohan Gavaskar. Mukesh said his name was regictered in nine record books on national and international levels, which included the Limca Book Records 2012, World Record Association, China, Everest world record, Nepal, India book of records, Asia book of records, Unique world records, Record holder Republic, Assist world Record, World Amazing Records, World Record India. Pinegrove girls were declared winners in the IPSC Girls' Cricket Tournament 2012 (U-19). In the final match of the tournament, Pinegrove batted first and scored 98 runs for the loss of five wickets. Kavya scored a scintillating 39 runs, while Diksha contributed a sedate 20 runs. In the battle of nerves, Modern School girls could only muster 71 runs for the loss of nine wickets enabling Pinegrove to lift the cup for the second year in a row. Tight bowling and sharp fielding by Pinegrove girls kept the opposition under pressure from the very beginning. Khushboo was the star performer for Pinegrove taking five wickets. Kavya Singh was given the best fielder of the tournament award. Earlier, Pinegrove had commanded their way into the final by winning all their league matches in their pool while Modern School defeated the host team Mayo College, Ajmer, in the semi-final to set a title clash with Pinegrove. The victorious team was accorded a grand reception by the school management and proud parents on their return to the school.